Samsung just took the wraps off of the Galaxy S III Mini, a smaller and less feature-packed version of its hit Galaxy S III smartphone. The Galaxy S III Mini packs a 4-inch Super AMOLED display with a relatively low 800 x 480-pixel resolution, a 1GHz dual-core processor, a 5-megapixel camera, a VGA front-facing camera for video chat, HSPA data network support, Android 4.1 Jelly Bean, NFC, 8GB or 16GB of storage, Bluetooth 4.0 and a 1,500mAh battery. Samsung didn't specifically say where the Galaxy S III will land, according to CNET, but we're guessing its at least Europe bound, especially since Samsung unveiled the device in Germany. We also wouldn't be surprised to see it land on regional carriers in the United States, or on a major carrier as a budget-friendly smartphone. October 11 2012, London, UK – Samsung Mobile UK has today unveiled the Galaxy S III Mini, a compact version of the flagship smartphone, the Galaxy S III. The Galaxy S III Mini brings the high performance, intuitive ease-of-use and nature-inspired design of the Galaxy S III to an elegant, compact smartphone with a 4.0-inch screen. Simon Stanford, Vice President, Telecommunications & Networks Division, Samsung UK and Ireland said: "The award winning Galaxy S III has been extremely well received globally since it launched earlier this year so we are thrilled to be able to offer our customers the same revolutionary design, intuitive usability and intelligence in a mini version. We will continue to develop smartphones to cater for a variety of customer needs and this latest release demonstrates our ongoing commitment to offering our customers more choice at every price point." The Galaxy S III Mini is powered by Android™ 4.1 (Jelly Bean), the latest version of the world's most popular smartphone operating system, benefitting from fast, fluid and smooth graphics along with a new Google Search™ experience featuring Google Now™. 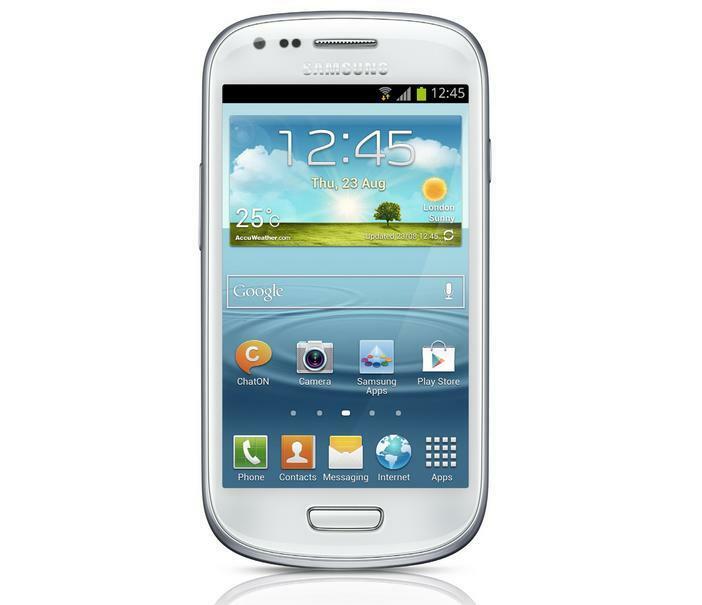 Stylish and compact, the Galaxy S III Mini shares the Galaxy S III's breakthrough design and simple elegance. Its ultra-minimal curved frame creates a rich natural feel, which is also reflected by its nature-inspired home screen, wallpapers and ringtones. A beautiful 4.0-inch Super AMOLED display offers a generous viewing experience that means multimedia and Web content can be viewed in brilliant colour and clarity. The compact size of the Galaxy S III Mini offers customers a comfortable grip and a convenient one-hand operation. The Galaxy S III Mini is packed with intelligent technology designed to make interacting with the phone incredibly natural and intuitive. S Voice, Samsung's advanced natural language recognition software, means your voice can be used to unlock the phone with simple customised commands. Your voice can also play a favourite song, turn the volume up or down, organise your daily schedule, or automatically launch the camera and start taking photos. The Galaxy S III Mini also understands human gestures to make using the phone easier and more natural. With Smart Stay, the phone's camera tracks a person's eyes and keeps the screen lit as long as they are looking at it. When reading a text message from a friend or family member, Direct Call allows customers to automatically call that person simply from the motion of lifting the phone to their ear; and Smart Alert conveniently alerts people to missed calls or messages as soon as the phone is picked up. Content sharing is easy and fast on the Galaxy S III Mini. Its S Beam feature allows a 10MB music file to be shared in just two seconds by simply tapping on another S Beam-enabled device, such as the Galaxy S III or Galaxy Note II, even without a Wi-Fi or cellular signal. The Buddy Photo Share function also allows photos to be easily and simultaneously shared with friends pictured in an image directly from the camera or the photo gallery.